Members of the hacktivist group Anonymous have released sixty hours of footage of the raid by the New York Police Department against Occupy Wall Street on November 15, 2011. The footage posted is from the NYPD’s Technical Assistance Research Unit (TARU), a surveillance unit that is regularly present at political demonstrations to film police actions. It was posted as a torrent for download late in the evening on September 23, 2012. A tiny sample of the footage, including a statement read by a member of Anonymous, was posted on YouTube. 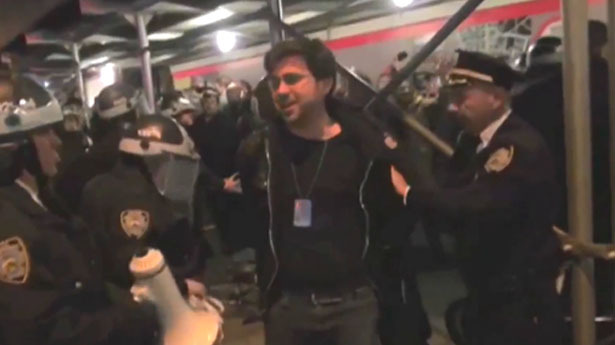 The computerized voice in the video begins, “On November 15, 2011, the NYPD surrounded Zuccotti Park and proceeded to forcefully dismantle the Occupy Wall Street encampment. As part of this effort, the authorities made all media leave this scene and the only images of what happened came from livestreamer who stayed in the center of the park until his arrest and one other citizen journalist who kept filming on his camera and managed to smuggle his footage after the arrest zone.” It goes on to say a “trove” of video shot by the NYPD itself from “fourteen different angles,” including surveillance cameras, is being released. To use a term writer Glenn Greenwald has used, this act of forcible radical transparency was couched as a response to the NYPD’s decision to deny freedom of the press during the raid. The right people have to view this footage, according to Anonymous, stems from the fact that the police would not let people film or record what was unfolding the day of the raid so, in order for the public to see the truth of what happened, obtaining and releasing the NYPD’s own footage had to be done for the sake of freedom and liberty. It was not ‘leaked,’ and does not show any misconduct by police. Contrary to the narrator’s account, there were scores of protesters who took video with no attempts by the police to confiscate it…I saw one protester standing near me who videotaped the same opening scene in the YouTube video of officers sawing a chain that two protesters used to chain themselves to a tree in the park. Further, the west side of Zuccotti Park on Church Street was lined with television news personnel and satellite trucks, many of whom filmed events that night. First, Browne referred to the clip online, not the eleven gigabyte torrent online with video from Detective Pierre, Detective Lombarid, Detective Rivera, Detective Cannizzaro, Detective Livingston, Detective Bellinger, Detective Cruz, and Detective Sciacca. Each were TARU officers recording video at the scene. Second, Browne suggested to Politicker the footage was “not ‘leaked’ by the police, but possibly by someone suing us” and that it was “not much of a leak since it’s part of the court record.” If the footage was indeed “leaked” by someone with either of the lawsuits against the NYPD, that would mean someone was taking steps that could seriously compromise these efforts. The “leak” would only be able to come from individuals with suits, such as the Occupy Wall Street Library or four New York City lawmakers and several journalists. Is it possible the footage had been provided to lawyers for either of these cases? Let’s presume Browne is correct. Lawyers for the four lawmakers and several journalists from Wylie M. Stecklow of Stecklow Cohen & Thompson, Leo Glickman of Stoll, Glickman & Bellina in Brooklyn and Yetla Kurland of the Kurland Group had the footage. Someone from Anonymous hacked into a server with one of these firms and obtained copies of the footage? The firms had the footage but it was not secured? And a member of Anonymous committed an act intended to send a message to the NYPD that actually will make it harder for lawyers to defend people whom the NYPD violated in the raid? Gideon Oliver, president of the National Lawyers Guild, New York Chapter, told The Gothamist, “I can confirm that TARU video and other video arising from the November 15th eviction was turned over to defense attorneys…That happened some time ago.” That does not confirm the footage was not secured and someone with Anonymous. At this moment, it is unknown where the footage came from exactly, however, if someone with Anonymous hacked files in the control of lawyers, this changes how someone should view this act of forcible radical transparency tremendously. Third, Browne wildly claims there was no misconduct by police and no effort to confiscate any video from members of the press. But Free Press’ Josh Stearns put together a Storify documenting journalist arrests that shows this could not be more untrue. According to Stearns, November 15 was the “single worst day for journalist attacks and arrests to date.”NPR freelancer Julie Walker was arrested. She had NYPD credentials dangling around her neck. Jared Malsin, working for the New York Times‘ Local East Village identified himself as press, showed his credentials but was still handcuffed and arrested. Jennifer Weiss, videographer and journalist for Agence France Presse, and Karen Matthews and Seth Wenig of the Associated Press were arrested. These accounts from media deeply conflict with the suggestion by Browne that press could stand anywhere and film or record what they wanted in the park as protesters were hauled off to police vans and the encampment was torn down. But, then Browne probably said this thinking even if one were to prove him wrong it would not matter. The police would be able to continue with business as usual, even if they were again proven to be an organization that has zero respect for freedom of assembly, speech or the press. Finally, The blackout is why someone from Anonymous took the step of placing the footage in the public domain. Had the press been allowed, there would have been media showing police. Any offenses or brutality committed by police could have been used by individuals seeking to file suits. But Mayor Michael Bloomberg and the NYPD made sure there was a minimal amount of footage. Now, there is video to confirm stories shared by those who were in the park during the raid. This release of video should be a significant news story, garnering much more attention, but at this point, only Salon‘s Natasha Lennard, DNAinfo.com, The Gothamist and Politicker have published stories.